ACT English: Should I Choose Who or Whom? Who is a pronoun that works as a subject. This means that the word who can take the place of the subject, and it will be doing the action! English Pro Tip #1: Choose who when the pronoun is used as a subject (doing the action). 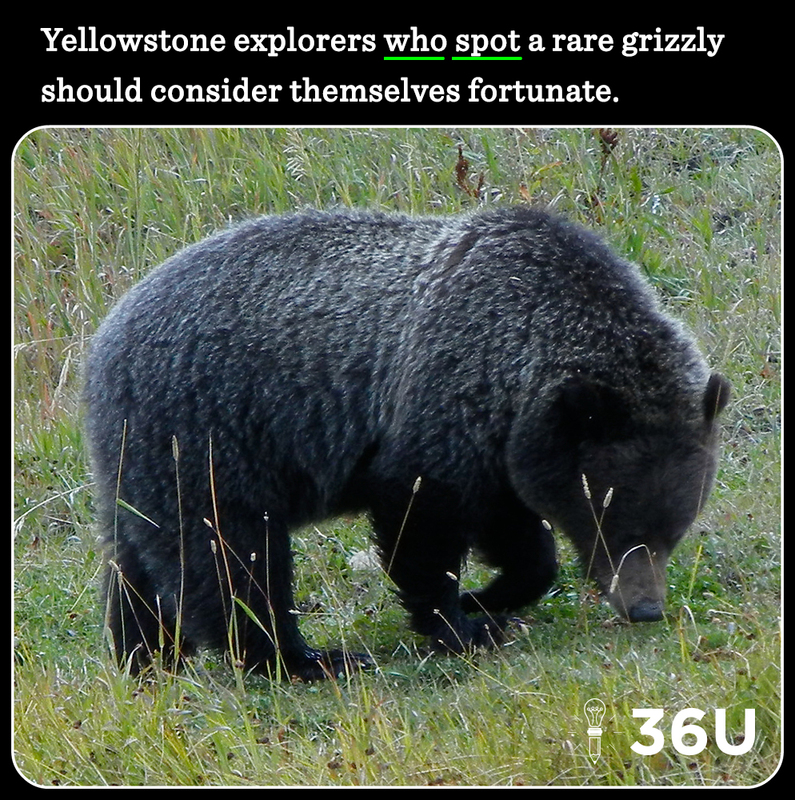 Who is doing the action – spotting the grizzly bear – so who is the right form. Whom is the object form of the pronoun who. If the pronoun is having the action done to it as the target of the action, the pronoun is serving as an object pronoun — in that case, choose whom! English Pro Tip #2: Choose whom when the pronoun is the object or target (the action is being done to it). I invited my friend to travel with me. Whom is the target of the action, so it’s the right choice here. Recognizing a prepositional phrase and choosing whom as the object makes for the easiest of your who-or-whom choices. 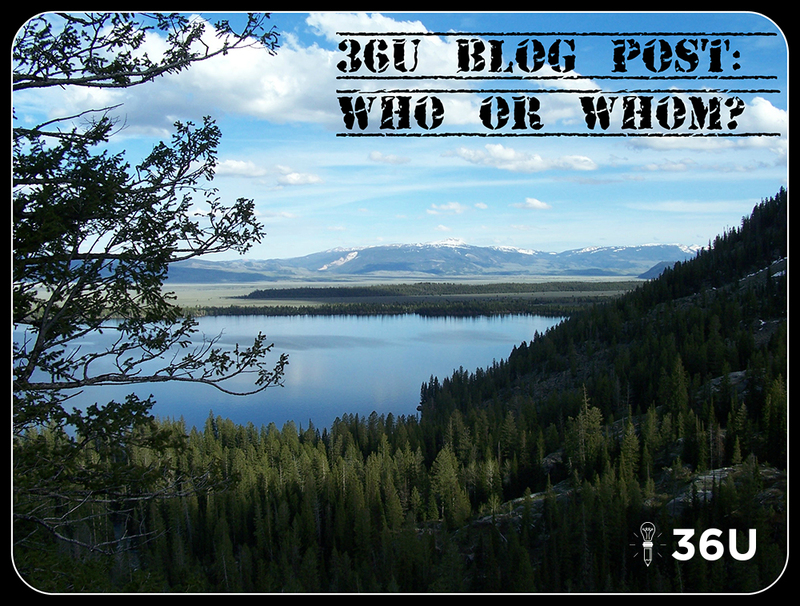 English Pro Tip #3: Use whom when the pronoun is used as the object of a preposition. She kept you from getting information about who is planning the party. Who is serving as a subject pronoun doing an action – planning the party. In this sentence, who is the correct choice. 1. The students that toured Mammoth Hot Springs also swam in Yellowstone’s Boiling River later in the evening. 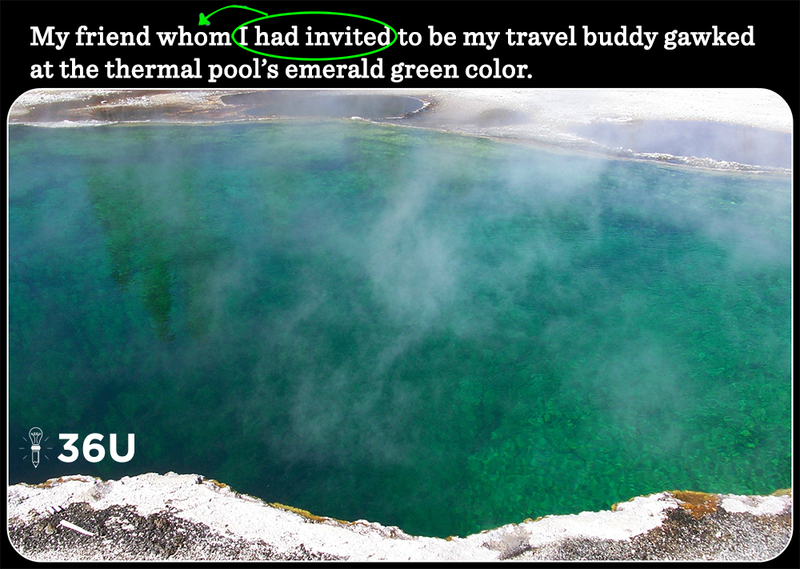 B. that swam in Yellowstone’s Boiling River later that evening also toured Mammoth Hot Springs. C. who toured Mammoth Hot Springs relaxed by swimming in Yellowstone’s Boiling River later that evening. D. are swimming in Yellowstone’s Boiling River, after which they toured Mammoth Hot Springs. 2. The Old Faithful Inn recruits high school students who travel from all over the country to work during the summer. 3. The park ranger found the students to whom the bison had charged. 4. 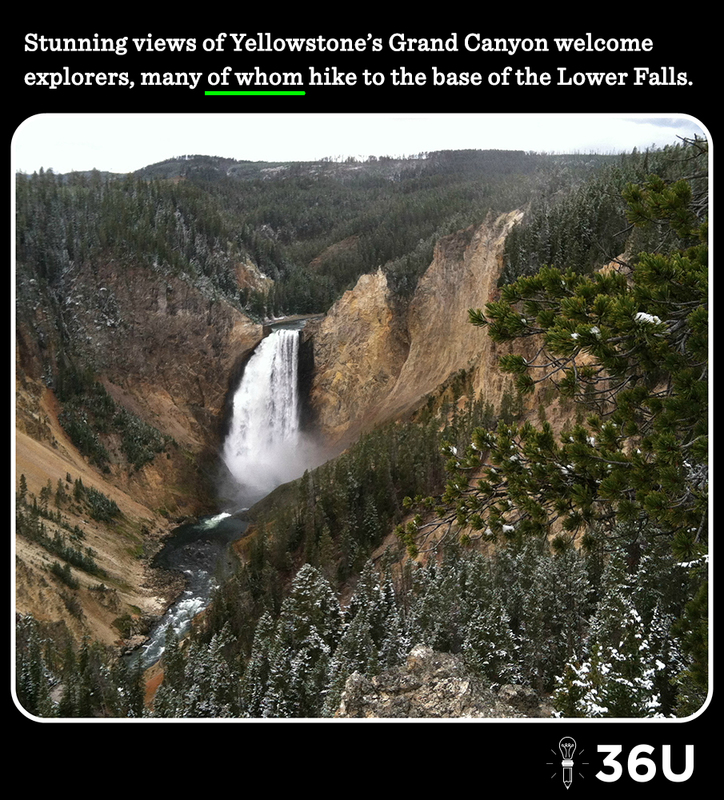 Yellowstone National Park attracts thousands of visitors each year, many of them come to see Old Faithful. 1. C — Choice C uses the pronoun who to refer to the students instead of the pronoun that (choices A and B). The pronoun is also doing the action — touring — so who is the correct form. 2. A — The pronoun who is used as a subject pronoun and is doing the action (traveling). 3. C — The bison charged the group of students. The object form of the pronoun — whom— is the right choice. Choice A is wrong because the wording is awkward. Choose C.
4. B — The pronoun is the object of the preposition. Choose of whom. Choices A and D both create comma splices (two complete thoughts connected with a comma).